[SatNews] "This object appeared to move really fast in the WISE data. That told us it was something special." NASA's Wide-field Infrared Survey Explorer (WISE) and Spitzer Space Telescope have discovered what appears to be the coldest "brown dwarf" known—a dim, star-like body that, surprisingly, is as frosty as Earth's North Pole. Brown dwarfs start their lives like stars, as collapsing balls of gas, but they lack the mass to burn nuclear fuel and radiate starlight. The newly found coldest brown dwarf is named WISE J085510.83-071442.5. It has a chilly temperature between minus 54 and 9 degrees Fahrenheit (minus 48 to minus 13 degrees Celsius). Previous record holders for coldest brown dwarfs, also found by WISE and Spitzer, were about room temperature. WISE was able to spot the rare object because it surveyed the entire sky twice in infrared light, observing some areas up to three times. Cool objects like brown dwarfs can be invisible when viewed by visible-light telescopes, but their thermal glow—even if feeble—stands out in infrared light. In addition, the closer a body, the more it appears to move in images taken months apart. Airplanes are a good example of this effect: a closer, low-flying plane will appear to fly overhead more rapidly than a high-flying one. After noticing the fast motion of WISE J085510.83-071442.5 in March, 2013, Luhman spent time analyzing additional images taken with Spitzer and the Gemini South telescope on Cerro Pachon in Chile. 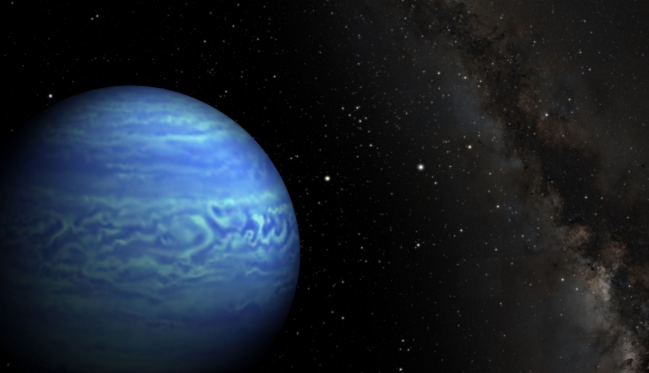 Spitzer's infrared observations helped determine the frosty temperature of the brown dwarf. Combined detections from WISE and Spitzer, taken from different positions around the sun, enabled the measurement of its distance through the parallax effect. This is the same principle that explains why your finger, when held out right in front of you, appears to jump from side to side when you alternate left- and right-eye views. "It is remarkable that even after many decades of studying the sky, we still do not have a complete inventory of the sun's nearest neighbors," said Michael Werner, the project scientist for Spitzer at NASA's Jet Propulsion Laboratory (JPL) in Pasadena, Calif. JPL manages and operates Spitzer. "This exciting new result demonstrates the power of exploring the universe using new tools, such as the infrared eyes of WISE and Spitzer." For more information on NASA's WISE mission, visit.